Heteroxenia fuscescens is a common zooxanthellate soft coral on the shallow reefs in the Gulf of Eilat, northern Red Sea. In the Red Sea, during its prolonged planulation, H. fuscescens is subjected to a seasonal environmental regime that alternates between stratified warm summer waters and upwelling of low-temperature winter waters. To examine the possible relationship between these seasonal fluctuations and the reproductive characteristics of H. fuscescens, we monitored its breeding activity for a 6-year period, including the percentage of colonies releasing planulae, number of planulae released per colony per night (fecundity), planula size and percentage of released deformed planulae. During summer and fall the combined average percentage of planulating colonies of H. fuscescens was significantly higher than in winter and spring. In addition, fecundity was greater during the summer than the rest of the year. Planulae released during summer were longer, with almost zero percent deformation. During the rest of the year they were shorter, with a higher percentage of deformation. The current study indicates that although H. fuscescens reproduces all year round, the quantity and quality of its reproductive features are subject to seasonal variability. In the Gulf of Eilat seasonal changes in the abiotic features of the water may have an impact on its reproduction. During summer, primary productivity reaches a distinctive maximum up to a depth of about 40 m. The winter upwelling waters introduce nutrients from the depths into the upper 200 m, and especially into the major primary productivity zone, thereby triggering the annual phytoplankton bloom. 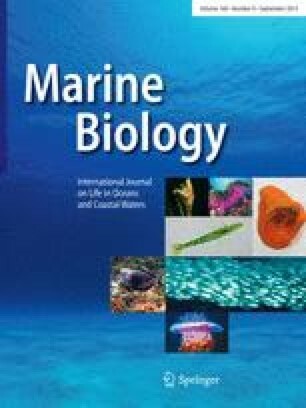 Because colonies of H. fuscescens gain nutritional benefit from uptake of organic material dissolved in the water and by carbon fixation by zooxanthellae, we␣suggest that the seasonal fluctuations in the species' reproductive traits are related to these fluctuations in nutrient and light levels.